C.Proppé Artist's Blog: The Art of Glass: Google Glass Lost at Sea, or "The New Beach Glass"
Pretty large waves close to shore in Bolinas today, and they were unpredictable. First, the good news. It's really hard to feel bad right now when today was such a beautiful gift. 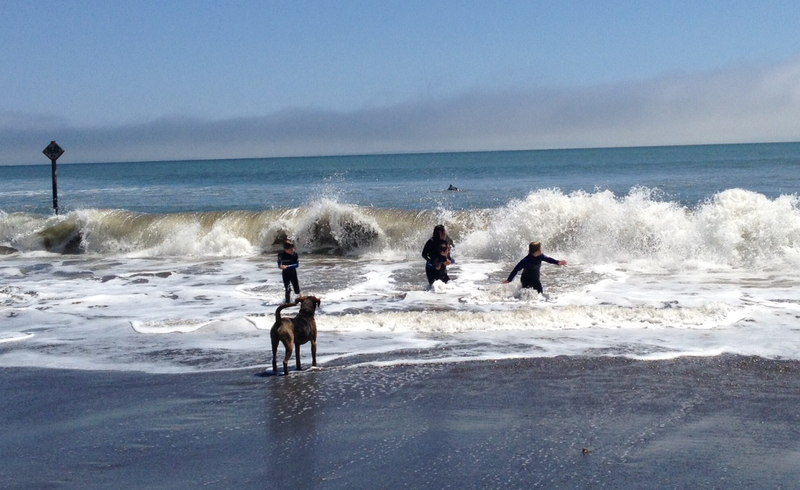 I watched my twin boys in their second day of surfing lessons with Natalie Pepper, of Spectrum Surf Camps in Bolinas. Natalie has been the Resource Specialist at their local, Public School for many years now, and so she knows my sons unique behaviors quite well. We were delighted to have a sunny day today, when yesterday was socked in with fog and quite cold. I had taken some Google Glass videos from the beach yesterday and found that they were taken too far away to really show much of interest in the surfing lessons. Today, I decided to put on my suit and get in the water with Natalie and the boys, in an effort to use Google Glass up close. Having worn Glass in a Kayaking Video on Tomales Bay, I was feeling pretty confident about using it as I waded in the water with my sons. I was in about two feet of water when I lost Glass in a wave that hit me from behind. I can't even remember the exact series of events, but I remember falling left into the water as I was hit with the wave, and the glass fell off my face as my head was tipped down. All I remember was coming up and watching wave after wave go forward and backward over the spot, and it was grey and brown and there was nothing at all for us to see. My Google Glass was "Slate" in color, which is the light, silvery grey and blends in with sand, stone and water. Natalie and I fished around with our feet, trying to find Glass, but the waves were spitting the rocks at my feet along the bottom. A 6" crab had washed up on the shore moments ago, and it was heavy. Large stones on the bottom were pushed quite far with each wave and the undertow. I looked up the weight of Google Glass tonight and it is listed as weighing 1.28 ounces. It really is incredibly light, but it does not float. Site of the Lost Google Glass, just to the left of "The Groin". I emailed my trusty Google Glass Support Team, who had never let me down before. I have spent time online and on the phone with a few different Glass Support folks, and they are wonderful helpers. We have always solved my issues and usually, quite quickly. Their response today via email was very kind, and they were very sorry I had lost my Glass, and they were worried about me, asking if I was ok! That was really nice. I felt they had my best interest in mind. I was asked to see if there was any way to find the Glass in the morning, when the tide was down (the surf instructor mentioned she could look on the beach in the morning). I said we would try this, but I imagined the device would certainly be ruined after being submerged for so long. After spending several hours looking for Glass while my sons continued to play on the beach, we packed up and drove the car around to the other end of the Beach, and I walked from one end to the opposite end where I'd lost the Glass. I looked all along the shore and in rocks and crevices where it could have been caught (I'd hoped). Unfortunately, my Google Glass was really lost at sea. Tonight, I went online and found a few different accessories that you can add to glasses to make them float. I have been a sailor and windsurfer in my past, and my sons have a brand of floating sunglasses from a sailing camp they attended last summer. I have no idea why I thought I could just go in the surf with Google Glass and not have some form of safety necklace(like Croakies) or a floatable device. Maybe since I'd never had the Glass fall off my face before and since I'd taken them kayaking in good weather... maybe I just thought there was no way this was going to happen. Well, I am here to tell the rest of the Explorers to be more careful than I have been. Maybe "Chums" neo-megafloat could work-- It is supposed to float things up to 3 oz., so Google Glass would certainly fall within this limit. There are several other products that can float glasses or simply keep them on your face if you fall. I guess I really wasn't thinking this was going to happen to me. As I heard Natalie telling all the boys in the water today, "Never turn your back on the ocean", (sneaker waves are very dangerous), I felt like I had done just that. I turned my back on the ocean to follow my son on his surfboard, and I wasn't paying attention to my own safety needs. Although I wasn't hurt, I lost a very fun and expensive gift that I have been enjoying with my family since the day I picked it up. In just about one month's time, I have written 12 blog posts about Google Glass, created 6 edited short video features with Google Glass on a local cycling shop and fundraising event, our local watershed, running, mt. 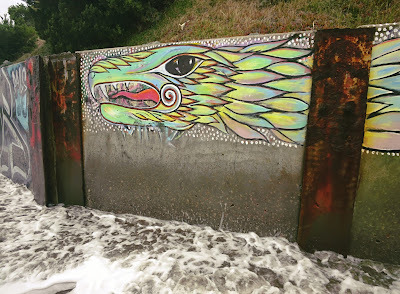 biking, kayaking, creating an oil painting from a Google Glass video, and the most recent was of my son using Google Glass to explore a local skate park. 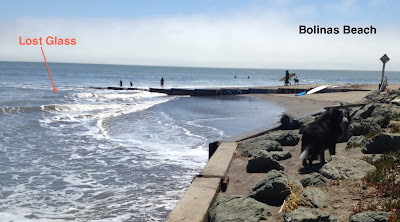 The next in my series was going to be on surfing lessons, and the last videos that autobacked up from my Glass device were taken on the sandy part of Bolinas Beach the day before I lost the Glass in the water. I would say that in less than a month, Google Glass has consistently been a part of my life in that I have wanted to use it to take photos and record video due to its ease of use and simplicity in autobacking up the videos to the cloud, enabling me to edit them on my desktop computer or laptop. It has been wonderful, and I will miss it very much. I don't know what Google is going to do for me, if anything. I am hoping that I will serve as a lesson to all the other users to be more careful, and maybe find a solution that will ensure Glass can float in the water. Even when I was kayaking, there may have been a moment when I took the Glass off to put on a hat or fix my hair, or put on sunscreen. Having a way to keep Glass afloat for even a few seconds could probably have saved this Glass from its demise. I think it is worth the $9.99 investment in Chums megafloat or some other accessory to see if it would have saved my Explorer Edition. I thought about hiding the fact that this happened to me, which is why I haven't tweeted or Facebooked or blogged this until late tonight... but in the end, I decided that it was more important to be honest and give other Explorers the chance to protect their investments and think more wisely than I have thus far. In my excitement and enthusiasm for the new technology, I got carried away with fearless use of the product, which sadly ended in it's demise. I am hoping that the money we paid for the device will cover a replacement product for continued testing, or maybe Google will trade me a new Glass for an oil painting inspired by my photos taken with Glass... which was my original reason for wanting to try Google Glass. I have in fact taken several photos of cyclists that I am definitely planning on painting. Do you think Google should give me a new Glass for continued testing? Or, do I deserve 20 lashes with wet seaweed? A friend said tonight that he knows the Pacific and with the undertow, he is sure it is way out deep by now and someday, someone will find it and say, "Look, it's the first wearable computer" and it will be worth millions. Hmmm.... I wonder. I am so sorry to hear the Pacific took your Google Glass. That wave must have been envious of all the fun you had with it... I hope Google will replace it for you. Maria, Thank you! Yes, I briefly imagined one of the seals we see has a pair of Google Glasses now, and is taking video of his seal friends. It's almost that easy to use, but more likely, it is at the bottom of Bolinas Lagoon. The current runs that direction. Who knows. I guess we will see if anyone finds it! Sorry, I know how much fun you were having with them. Too bad they don't have insurance. I know how you feel. I dropped my phone(s) in the toilet twice in one month. That really hurt. Life's lessons. Toni, I think this is a little different, in that these first Edition products are beta-versions. I am hoping that the $1,500. we had to pay and the valuable information and advertising buzz we create for Google Glass is worth it to them to supply me with another pair to continue testing them. Did you put your iPhone in a ziplock bag with those silica packets from dried seaweed? That's how we saved an iPhone that was thrown in a pool by my son once. It worked the next day after being in a container of rice and those photography/nori packets! Sorry about your phone. At least it wasn't $1,500., right?